The Orange Glo Hardwood Floor Cleaner is the cleaning product you need for cleaning your hardwood floors. Our water-based, non-toxic cleaner is specially designed for polyurethane finished hardwood floors. Unlike all-purpose cleaners and soaps, it quickly cleans tough stains and spills without dulling your floor’s finish or leaving any residue. 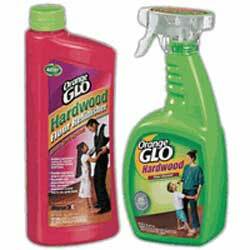 Plus, there’s no mixing or diluting; Orange Glo Hardwood Floor Cleaner is full-strength and ready to use! The Orange Glo Hardwood Floor Refinisher is the refinishing product you need for refinishing your hardwood floors. If your hardwood floors are looking dull, worn and scratched, the Orange Glo Hardwood Floor Refinisher can give your floors a bright new luster. Specially formulated for polyurethane wood floors, it refreshes the appearance of your hardwood floors with a crystal clear, highly durable gloss shine. Plus its water-based formula is safe and non-toxic.